Important stuff for working on things light HV flyback circuits (old TVs, monitors, neon signs, etc).. but it CAN still kill you with the potential from circuit to circuit ground. You’re just not as vulnerable (with isolation) from circuit to earth ground. BTW… If anyone is considering buying an isolation transformer.. go the extra step and get yourself one of these newer variacs (variable voltage out transformers) that now feature isolation. Variacs are an invaluable transformer with a variable voltage secondary that lets you “dial a voltage” to get any variable AV voltage anywhere between 0-120% of the incoming 110/220AC voltage. VERY handy on a bench! Transformer bigger than my hand? When working in the video game industry, I always saw these in the bottom of Pinball machines. I don’t know if they were for noise cancellation or for safety, but it was just a 1:1 transformer. Maybe a possible source if someone is looking for one. Find an old pinball machine that is being scrapped for parts. Don’t most scopes STRONGLY caution the user AGAINST floating them like this? Good info, but lengthy, ended up skipping parts. Condense it down to 15-20 mins, then the video would have been better! Great info, but I too thought that it is too long. I think the first part of explanation was unnecessary since same topic has been shown on the white board. You can build an isolation transformer from two microwave oven transformers. Just connect the high voltage windings together. If you prefer to avoid the presence of high voltage, You can cut the welds holding the core together and replace the high voltage winding on the first transformer with the low voltage winding from the second. Add a few turns to each winding to reduce magnetizing current and improve regulation. Yes, and a good link. But in the video he seems to be demonstrating floating the circuit under test and not the test equipment itself. He never once plugged his scope on the isolation transformer. Floating the scope is scary, because depending on what you do with the probe ground clip, you could bring the scope case to a dangerous voltage, making it dangerous to touch the scope. Paul: Ahh! See, this is what I get for not watching the full video! It looked like he was explaining why floating your equipment is a good idea, but if not that is far less scary. RTFA I guess! @Paul, I agree about plugging the scope in to the xfmr as well. Some pretty good info here, but it certainly could be redone and condensed quite a bit. Cool video, but yes it was too long. I also felt like I was in a lecture most of the time. A more relaxed tone and less repetition would make this video amazing. The nice thing about video is if I didn’t catch it the first time, I can rewind it an play again. 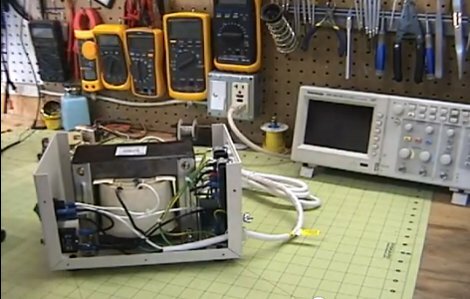 In the video he does say that you should never plug the scope into the isolation transformer, nor should you clip the FG pin on the scope because it is dangerous. @spork:Ahh, now I see: Yeah, in fact, I’ve had that very problem before: A floating ATX supply became internally shorted +12 to gnd. When I tried to probe ground to – and probe to +, I put 100 A through the scope. Luckily it could handle it. The probe wire, not so much. Which makes me wonder, why the grounds of the probes don’t have small inline fuses. Seeing a transformer bigger than your hand? I seem to remember that pole top transformers are common in the US. There are probably a fair few others that don’t come to mind straight away, but no, they’re not uncommon at all. Thanks for the video. Looks like he has been influenced a lot by Dave Jones(eevblog) and trying to emulate everything, even the way Dave says cya with the hand wave, fast video playback when disassembling, shirt, white board, …. Yeah, big transformers are all over, just well hidden or in unexpected shapes. In the labs at university we’ve got the oscilloscopes hooked up on isolation transformers to avoid the nasty habit of shorting something to ground accidentally when measuring DC-DC converters (and its a fun class because if you fry anything you have to fix it yourself). For the higher voltage AC stuff (motors and such) we usually use isolating differential probes. I, uhm, learned in third grade, that uh, saying “uh” is just what, uhm, people do when, uh, they’re not sure what to say when one, uhm, feels inclined to say, uhm, something when, uh, nothing is there to be said. I learned, uh, at the same time that, uhm, ah, it is better, uh, to just pause when when speaking. This works much better. I don’t have to annoy my audience with superfluous and useless noise when I (the speaker) need a bit of a pause, and I don’t waste the breath. When I need to think in order for my next bit of verbiage to be clear, I just stop and think. Just. Wait a second, and don’t say “uhm”. It’s OK — you’re a talented engineer, and I’m interested in what you have to say, and, um, I don’t need you to make noise while you form your thoughts. Just finish your thought, and start your next, and don’t say “uhm” if there’s a gap there. I, um, also understand that it, uh, takes some, ah, time to sometimes finish a thought in detail. Use the time. But be quiet about it. Interested people will, uh, pay attention whether or not you, uhm, make random vocalizations. And uninterested people, ah, will never pay attention, uhm, to begin with, so don’t, uh, worry about them. But, uh, some folks are annoyed at the, uh, the repetition. Do you, uh, know what I mean?